Guest comment: Andrea Canè, Woolrich International: Dear Outdoor Lovers! We are very proud to welcome Andrea Canè, Global Creative Director, Woolrich International as guest editor for our brand new Outdoor Issue. Working with him was very informative, always inspiring and extremely exciting. Many thanks for that! Read Andrea Canè Guest Editor's Letter here and be curious about more stories and highlights from the booming outdoor sector we are posting the next weeks. Stay tuned! Throughout my career I have spent long time taking care about outdoor products as I have always been attracted by everything they represent. Outdoor apparel has many faces–more or less active, physical or contemplative, as it can be worn in more or less extreme landscapes. The outdoor product is based upon a simple philosophy: it has to perform or, better, it has to have a function. Outdoor pieces made with natural materials that are more sustainable and long-lasting such as wools are surely making up the “performing chain” of outdoor materials: merino wool insulates and lets skin breathe as much as most modern materials do; cotton canvas is intrinsically sturdy and betters its comfort with the passing of time; cotton rip-stop is woven according to a construction that reinforces the fabric while making it becoming tear-proof, though it maintains its lightweight and highly biodegradable characteristics. Since the 1950s/1960s, technological innovation has produced new materials from chemical polymers of a different nature that have bettered clothes’ performance and, if thrown away and recycled correctly, can continue their lifecycle for a long while. 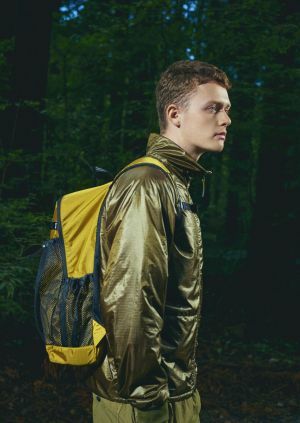 Technical hydrophobic and breathable membranes have brought a revolution in outdoor fashion and changed garments’ performance in prolonged and extreme conditions. Stretch fabrics have allowed a new comfort and mobility in this segment that have become characteristics anyone can’t do without. Today outdoor has been certainly affected by the aesthetic factor. Especially in the last decade, Millenials have pushed outdoor ahead to become more modern and design-driven. “When outdoor meets fashion” or better “when fashion meets outdoor” synthetize exactly what is happening. We are facing an approach to a new “plein air,” a vision I have shared for a long time. It blends together functionality with a new aesthetic taste, opens up pure outdoor use and starts embracing a life philosophy that makes anyone always feel protected and comfortable also in urban landscapes and not only during outdoor activities. Crucial for this change of direction have been Japanese insiders and companies. For this reason we have featured many of them in this issue. Northern American insiders are masters of traditional outdoor, even if they have been less interested in the aesthetic aspect and style change and more focused on purely functional and sustainable aspects. I owe much of my outdoor background to US insiders, to the years I spent riding my old VW camper, a model from 1978, travelling around some of most suggestive places from East to West through camping grounds, parks and wild regions of America and Baja California. All of them left me unforgettable memories and unique outdoor experiences: High deserts, white sand dunes, unique and unexpected microclimates, sophisticated Eastern landscapes juxtaposed to the arid beauties of the South West, or Napa Valley’s sweetest ones. American habitats’ variety is unique and impressive, and pushes to travel and “wear out” outdoor, while always respecting this natural heritage that we shall commit ourselves to preserving for future generations. “Take only memories, leave only footprints” said billboards planted at the entrance of every trail and in every wild place one entered in the 1970s and 1980s. I think Chief Seattle, a Native American leader highly respected for his ideas about preserving the environment, created that slogan in the 19th century but it is still valid for treating nature when partaking in outdoor activities. In those territories I grew my ability to scout unique and high-performance products. For many years I have cared for the evolution of the Woolrich brand that since 1830 has been offering outdoor apparel. The story of this brand is the story of outdoor itself. From blankets provided to soldiers during the Civil War to pieces designed to be worn while building the huge American infrastructures up to items devised for recreational outdoor activities of the last 50 years, this brand “taught” me what it means to design functional items that also have fashion content. The motto “garments with a purpose” exemplifies the fundamentals for developing outdoor products. What we as consumers choose when we buy an item for leisure time or when working outside of an office depends upon this. Through the series of interviews of this issue we have tried to represent some key aspects of what I call the “new outdoor wave” made up of companies that use a magnifying lens that hypes fashion and costume more than in the past: the combination with “coolness fashion” is earning greater importance in performance apparel. Have a look at our brand new Outdoor Issue - Going out with Woolrich's Andrea Canè as the Issue's Guest Editor - and read more about the booming segment.